When I was a teen all I knew of Vietnam was the war. I was in college when it was happening. I missed having to go fight by only a few numbers a blessing of the Universe. The draft had changed to a lottery system, no more deferments because one was in college or something other than medical. If your number was up you went. I even went down and had my physical. The Force was with me my number was not up. So I missed out. I knew people who went. Other than that I knew nothing of Vietnam except from some Vietnamese I meet later in life and some food. My Kung Fu teacher was there in the Army he taught rangers fighting. This is where he meet the grandmaster of the Tai Chi Mantis system, Chi Chuk Kai and studied under him. The Grandmaster had fled China to Vietnam. There he worked and also taught the Vietnam Emperor’s guards Tai Chi Praying Mantis Kung Fu. Later I had a student from Vietnam and met a woman who studied Feng Shui with me who was from Vietnam. This was the extent of my exposure to Vietnam. LZ loved Vietnamese food. For me it was good but not high on my list of favorite eats. Anyway so what you ask. 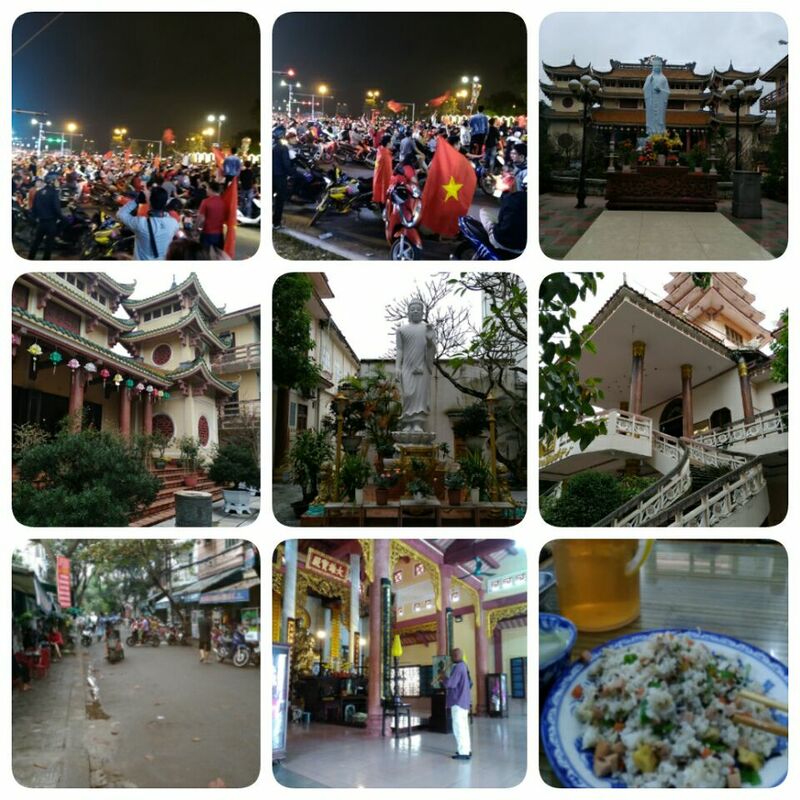 Well LZ arranged a trip to Vietnam, she came across a good deal and took it. Oh Yeah, my Sister-in-law and her husband had to move to Vietnam for 4 years just before we moved to Japan. She did not want to go at first, but once there they did not want to come back to Japan. They had a good life. The husband was sent there to work, so they had no choice in the move. So yeah they enjoyed it once there and settled in. My sister-in -law also developed a large following for her custom-made jewelry there. Ahh one more thing the owner of Aoki Yachts was having his boats built there and went somewhat often to Vietnam. Ok so this is my Vietnam knowledge, I had no real desire to visit. Unlike China, Taiwan, Thailand. Funny how one is drawn to some places. Others not so much. So LZ got this trip arranged. We were to spend a week there. However at the last-minute I found out I, as an US passport holder needed a visa to enter. So I had to delay my leaving for a day whilst arrangements were made. lZ left a day before me. It was fairly simple to get a visa, I had to pay for fast service, but the arrangements were made and I was on the plane the next day after my wife. I was not all that into going, this was more of a trip for her. She was really looking forward to one of the hotels we were booked at to stay. The flight took about 5 hours, it was smooth. Anything you wanted to eat or drink you had to buy separate, as it was a cheap flight. I landed without any problem and found my way to the immigration counter to get my visa stamp. That went pretty smooth. The people were not overly friendly but not rude, the uniforms were kind of really different from my view, well at least the colors. Very Communist through my eyes sort of unsettling. Western programing I guess. Ok so I am past all the stuff to enter and now the next thing is to get to the hotel. My wife had said only take this or that taxi, the others can not be trusted. That was also a warning from a travel site about taking the pirate taxis. I am walking around outside the airport looking for a taxi, a guy comes up and asks “you looking for a taxi?” I said it is ok, I am fine. I walk more, the cab I am looking for is not around. Another guy or maybe the same guy comes to me again a bit later. I say I am looking only for this name cab. He does something with his smart phone and shows me the text “there is no cab from that company today”! ( a lie!! I find out later) Ehh I think, ok what about this name? He says something like no worry I can get you a taxi, it will cost you this much to go to the hotel. I do not have small change for that, he shows me where to get change. I do that, then he has me follow him to the parking lot across the street. There is a car waiting, it is a plain car, not a taxi. I say no! I want this company name or this one. He says it is ok, this car can take you. I say no! I am from the states and know a hussle when I see one and walk away. I go to the taxi stand there is a taxi there the other company. I tell the driver I want to go to the hotel. There is a bit of talk between him and the guy. The driver says I can go with this other guy. The guy shows me a text again saying “we are not trying to trick you”. Another cab pulls up from the same company. I am told I can not take this cab it is called for someone. Now I am getting pissed. I say ok I will go inside and find someone to call me a taxi and I leave. Once inside I call my wife on the cell phone. She says no do not go with them, the taxi you want is hard to find, just a short walk and across the street in the parking lot is where they are. Hmmmm. I am on the second floor of the airport building I walk around so I can see the area across the street and spot the cabs I want! But I see no drivers. My wife says they are all on a bench sitting there. Ok, I start walking again this time I can see where I need to go. I make my way there without a problem and arrive. A driver asks me if I need a cab and I get in. We get to the hotel without any problem. It cost about $4.00 in Vietnamese money. I am not used to it. After fiddling with it for a bit the driver, helps me an takes what he needs. Ok he asks, I say ok thanks. I have arrived finally. I can now relax and breathe. After a while we head out to find a pizza place that was recommended, by sister. It is only a very short walk. We head there. There streets are fairly beat up, like Mexico but worse. So many motor scooters, like Taiwan but more. They are parked everywhere on the sidewalks and street. Everyone in cars are blowing their horns. I guess it is a warning to the bikers they are coming or turning or something. It was wild, glad we were walking. We make it to the Pizza place. It has a Japanese owner. The staff is very helpful and attentive. Very Japanese style customer service. The food was good! While there is a lot of people watching a soccer game across the street. From time to time something would happen and a lot of people would run over there to see the TV. Many were very excited. I thought it was some local game and the city team was doing good. We finish eating and leave to head back to the hotel. Once in the room, shortly after there is a lot of noise, horns blowing, people yelling. We can hear the din of noise even on the 15 th floor. I look out the window the streets a full of cars and bikes, full! I guess the team had won. This went on for about 30 min. I go downstairs to check on things. The noise is huge! I step outside the hotel there are flags and people on motorbikes covering the sidewalk and streets, it is mayhem! I find out the Vietnam team had won the semi-final match in China against Pakistan, the people were going nuts! We were suppose to go to get a massage across the street in an hour. I figured it would calm down by then. Wrong. It was still going strong an hour later, we slowly made our way through the crowded street and then across. We got our massage and returned and hour later. The streets were still packed , flag, bikes, men women, kids! Slowly slowly we made it back. We rest a bit then headed up to the rooftop lounge. It is now 4-5 hours later the crowds are still at it. We can see and hear from the roof top. It was wild! The next morning all was normal again. Wow! Ok the next day, there is light rain but not bad. We were going to change hotels that day, but my wife wanted to see a couple of things before we checked out. I wanted to get a vegetarian meal at one of the nearby restaurants. I also wanted to visit a temple I could see the roof of one from the hotel. She headed out to do her thing. I set out walking. I did a little research before-hand on the temple and had general idea where to go. 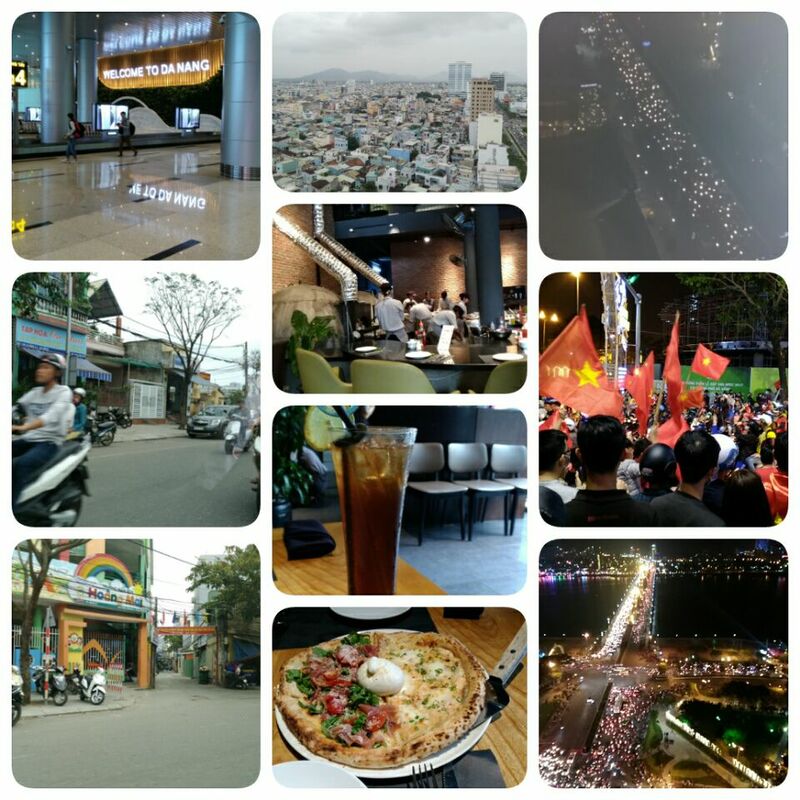 The walking was interesting, this was into the real city of Vietnam to local section. I got to where I thought the temple should be , but I ran into a block. The street ended and I had to go right or left on the crossing street. I turned on my Zen sense and walk left. After a very short bit I thought I would ask just to be sure. There was one man working in his open shop. I made a few hand motions and looked around. He figured out what I wanted and said I was going the right direction, just turn at the next corner. I was good. I bowed in thanks and took off. I walked and came across the temple, and several others. none had the roof line I could see from my hotel, this was not it, but it was a big temple and I thought it was part of what I was looking for. It was not I found out later. Anyway, I past one guy on the street, just at the temple. He said something I did not get I bowed and kept walking up to the temple. The guy comes over to me as I am standing looking through the gate. He says something to me, I did not get again. I ask, signal can I go inside the temple ground? As the main gates was closed, but the side gate was open, then I see someone go inside. He does not understand me. He puts out his hand for me to give him money. This I understand. I say no and walk inside the temple grounds. Inside I look around and go up to the main building. A monk and some others are sitting outside. I am told , by sign language I can go in. I start up the steps,. But am told I need to take off my shoes outside on the steps. I do so and go up to the main door and look in. I signal to the monk asking of I can enter, yes I am told, so I do so. I look around, a pay respects to the spirit figures. After a bit I take out my Shakuhachi and just play a lone note as an offering. I did not know if it was cool or not so I keep low-key. A short while later another monk or maybe the one from outside come into the hall. He does a small ceremony and chanting. I stand and bow with him and the gong as he prostrates himself. I thought this was a good thing, I could offer a prayer for My wife’s “Auntie” of sort, who just passed away the day of her leaving Japan. When it was over the monk left as did I. I next went into the yard ground walked around. I was going to spend a little time at the two outside shrines. As I was about to settle in and take some pictures the same guy comes inside the grounds now and over to me again with his hand out. This person did not look like he was suffering or homeless, just begging. Again I said now, and signaled go away. He continued. So I changed my plans and left…irked! As I am walking back to the hotel I passed the temple I was first looking for. I could tell by the roof line. I went in here as well. I Said a few prayers took a few pictures. This temple was closed. It looked like some work was being done as there was piles of sand and bricks and stuff around. The temple itself was closed, but the grounds were open, there was someone else also there praying. After I finished again I headed for the hotel. Once I got back to the hotel I got oriented with directions and set off to find the vegetarian restaurant. It took some effort and I walked past it at first. The map I had sucked. There was no internet service in the street so I just had to look. I was about to give up and was heading back and going to find another which was nearby, when I spotted it. I went in and nothing was written in English, I walked up to the counter and a woman shows me the menu that says there are veggie dishes and take me to a seat. I spend some time trying to figure out what was what . They woman comes back and helps me, she speaks some English. As time is running out before we need to check out of our hotel and change to another, I order something simple, fried rice. While I am waiting I am sitting with some locals. I watch they do, I see they take out the utensils on the table and wipe them with a napkin before using. When my food arrives, I do the same. The food is good, I add some spice to give it a little kick! I rush through eating since it took me longer to find the place than I planned. I finished eating quickly and made my dash back to the hotel to meet up with my wife to pack and check out. When I arrive she has everything packed and ready to go. She was on her way out of the room going to carry one bag at a time down to the lobby. I grab my stuff and we check out and grab a cab that is at the curbside. This is the same taxi company that we arrived in, they hang ouyt there at check out time. So we knew we were in good hands. So we are now finished with the business hotel and on the way to the resort hotel for the next two days. This was something that LZ was looking forward to. We left the downtown local area and headed to the upscale location next to the ocean. 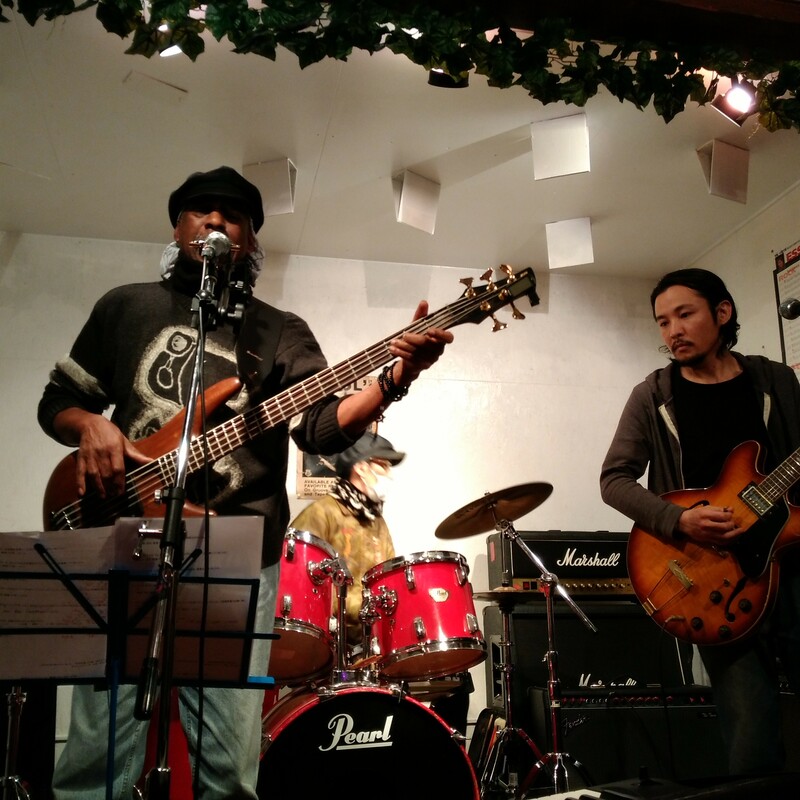 Last week or so, I had a showcase event with a new band, “Sakai Sieki”. I have played at this club, The Red House, a couple of times. The owner had made suggestions about us playing together. After our first meeting I had said I was looking for a band to join, he said he was looking for someone with my skill set. Nothing else was said for a while. Then again after I did a small spot there as a solo we spoke again briefly. After few days afterward I was asked if I wanted to join a jam session with a friend of his. Sure I said let’s do it. It went ok. It was easy and fun, we played, ate, and drank. It was a pleasant evening. A few days afterward I am asked if I wanted to do a show with them at the club. It was not a paid gig, but a showcase. We were to be the opening act for a couple of known groups. A test run as it were. I was asked about getting together for a practice session the day of the show. I said it was better to have a couple of practice sessions more so since it was our first time together. He agreed. The practice went well. I learned of their weak points, we all have them, so I adjusted the songs I wanted to do, to their skill set. Again overall it went well. The day of the show we again met and rehearsed. We were set. After rehearsal The drummer and I went to get something to eat. He is also a quasi Vegetarian, so we went to a place that I had gotten soy burgers from before. I was not really looking forward to going to eat with the drummer. He is a nice guy, likes to talk, but does not speak any English. That means I have to deal with only Japanese and figuring out what he is saying. Work!! We went to the restaurant, called “Mos burger”. Bummer bummer! They changed their Menu, no more soy burgers. Crap! I took a fish sandwich instead, as did the drummer. We spoke some, about Kung fu, a blues club nearer to my house, music, etc. it went ok. I did not get somethings, but I got enough to communicate. I am always surprised when I can do that. We ate, and went back to the club to wait. We had several hours to kill before show time. The other two bands showed up, and did their practice. I knew a couple of the players in one of the other bands, and one player in another. The one band where I knew two players, is a smoking hot band. I think for what I have seen the best Blues Band here in Osaka. It is good to be an opening act for them and not to follow them. They would be hard to follow, they are a tight sounding band! Show-time came, we were up. We did 6 songs. The one song I have been really wanting to do good, did not turn out so well, as least parts of it. The drummer forgot about the breaks I wanted, and I messed up badly once. Some parts were ok. With some more practice it could be a good song. We only really practiced it a couple of times. The other songs, went better, not perfect, but still ok. They were simple blues type songs. We played through the errors and just rolled with it. When it was done, we got a fair share of approvals. I figured out how to set my smart phone timer camera to record video on a start stop, start timer. That was cool and helpful, as well as painful to hear the mistakes. A good training aid. I did some editing and put together a sample vid, which can be seen here. A few days later after things settled and such, it was suggested we keep the band together, we could be good with some more time together. So officially I am with a new band now. One thing I have noticed about bands and players in Japan, players often belong to several bands and no one cares. It is normal, in the states, usually one is with just one band. A player can do more than one, but unless they are just floaters usually just one band is the focus. Another thing I notice is more people here just play to play for the music, not to become stars or get a gig. A gig is a Paying job, not a freebie showcase or something of that sort. Work is the goal not just playing to have a good time, that is what jam sessions are for, in the States. So this new band could be good, it may give me some possibilities of different expressions in sound. It is not a “Blues” band per-se. The term I heard was Neo-soul. Good, I like being able to do other songs other than just blues. I do hope we can get one other member, a pianist would be sweet, but a good horn or guitarist would also be nice. So this is something to look forward to for the upcoming year. I still will pursue my own solo path as well, but the band with give me a different musical outlet. I will still play with the Doc’s band when asked, but is a minor priority as he does not want to put in the work and time to be more than a “fun” time playing. I want to do more than play some little dive live house bar. I may never make it past that, but…one needs goals to be more than you are now…ones spirit, at least mine needs to grow! This is my 4th Hatsukai, I believe, if my count is correct. This year there was a new years gift exchange, of sorts. Everyone joining the Hasukai this year was suppose to bring in a gift of more than 1,000 yen ( $10) to give away. Nice idea, it was just our club, so it was sort of intimint. It was a fairly cold day, but not too bad. If I say it, it true. There is a sailing expression, no bad weather, just bad clothes. 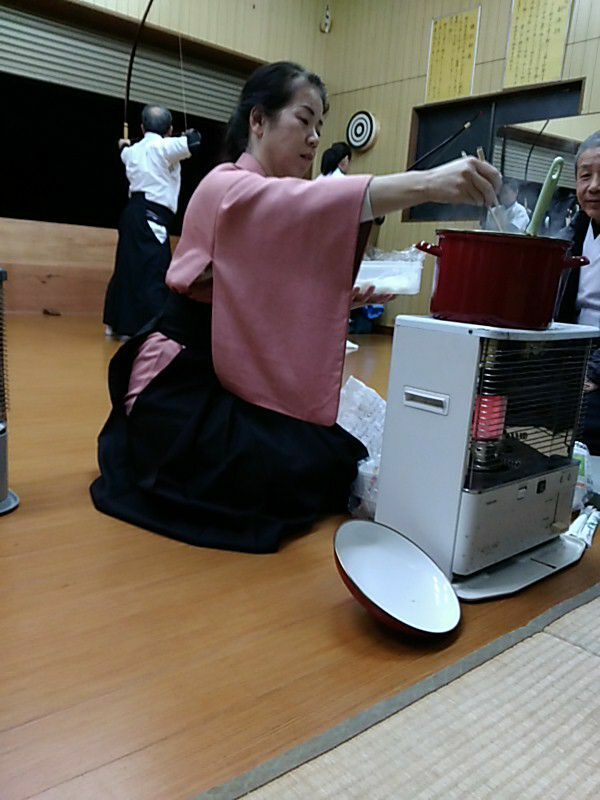 So I was dressed for Kyudo, and keeping that thought of being ready I had on several layers of understuff, then silks, for outside travel I had my big long coat. Socks inside my tabbies, and long johns legs were long enough to cover my feet to the toes. Yeah! I was ready, freddy. I arrived a little before the 1:00 pm start, and did my New Years geetings and got in a couple of shots before things started. Now after a few years of these things I can follow along easy enough even though sometimes, well most times I do not know what is going on. I just roll with it. This times was not different. I thought I knew what was happening at times, like the start, but I am corrected and adjust my sails. After everyone is signed in and ready there is the opening ceramony and annocement stuff. 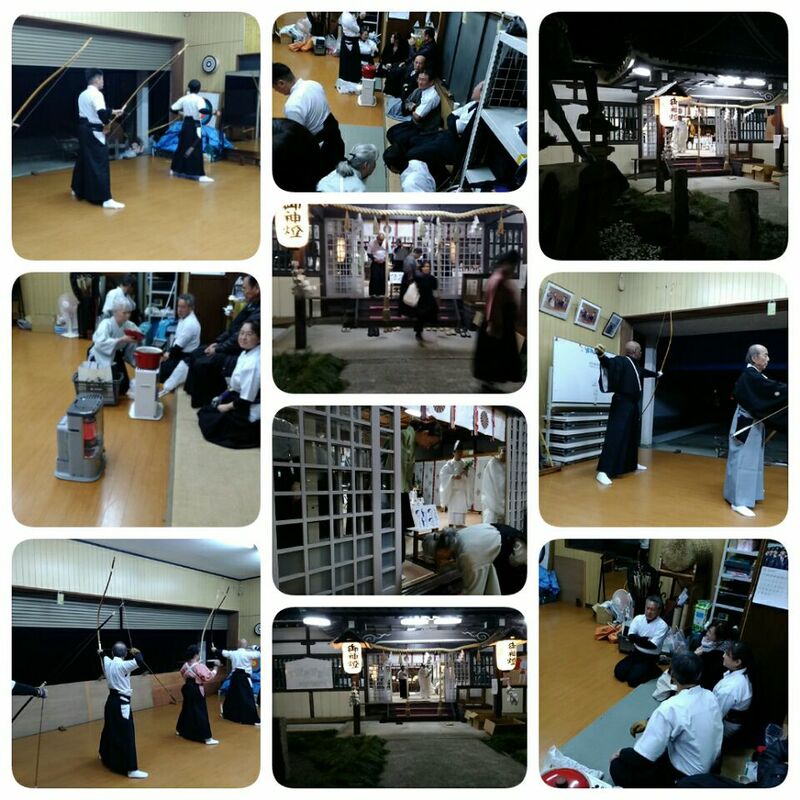 Then a “Sharei” of some sort, then round of shinsa shooting then the taikai rounds. I fall into my regular routine, I watch I shoot, I take photos, repeat. My first two shots missed, maybe I hit one, of the set of four, that followed. Maybe two, lost track. When I was warming up, Watase Sensei, I could feel watching me. As I was leaving the floor , he intercepts me and give me a correction on not drawing enough right out of DaiSai, I was cutting to short. Arigatou I saw and bow. I ask is my elbow height arch any better? He shook his head, said something I did not know but “knew” it meant no! He laughed, as did I as I bowed and turned off the floor. Later after my Tai Kai round, Yamashita Sensei intercepts me and says. Good job! I say, eh?! He was talking about a correction, adjustment he had given me last time I shot with him. It is a blessing to have these Sensei caring for my progress, even though not in a formal class. That is real concern for the student and honoring the practice from the heart. Ok, so moving on, things started warping up we are down to final shooting. Small targets, a single arrow per turn. I got in three shots, all misses. I did not care, I was in a it’s a practice mode. For some reason even though small than a regular mato, I expect the good shooter to make quick meals of this, but no, it was taking some time even for the good shooters. I was up again soon. Ahh, yes, it was taking shorter time between rounds becaus eit was only our dojo there not several for the area. Anyway…I digress. I am up again, I shot and bam, I get a hit. Lucky, it was a causal event, and subconcously I knew that, so when I hit I put up both hands, yatta! Thoses that saw smiled. I could not help but smile as left the floor… my posse’ was happy for me! So was I. My day was made. I had a “feeling” it was the day I was going to hit one of those mato. Yatta! 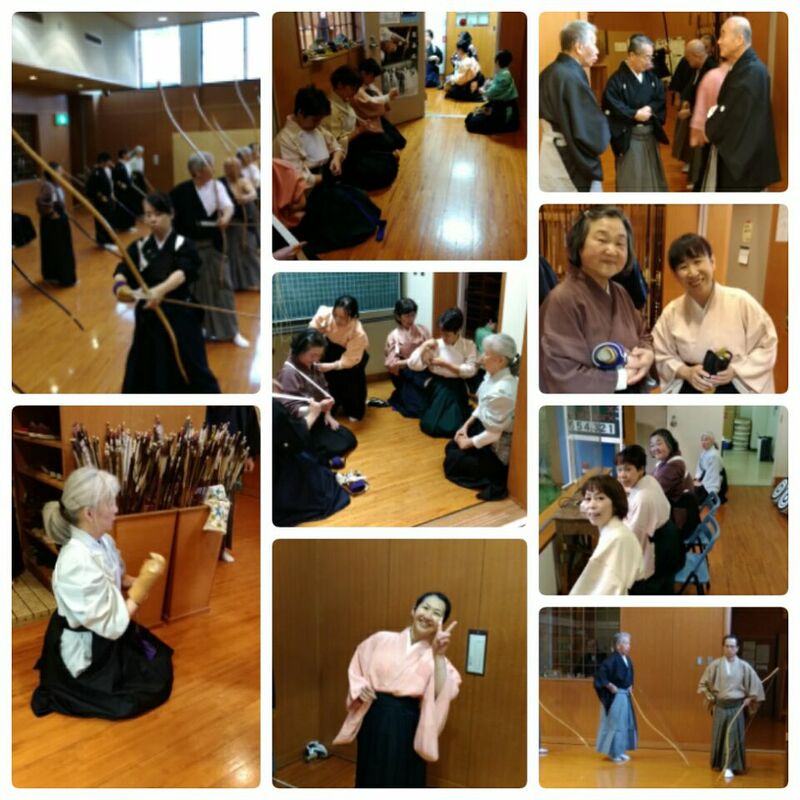 So yeah, it was good start to a new year of Kyudo. This is the name of the Shakuhachi group with whom I hang -out and play. More hang with than play, my skills are still weak on the 2.5 shakuhachi. 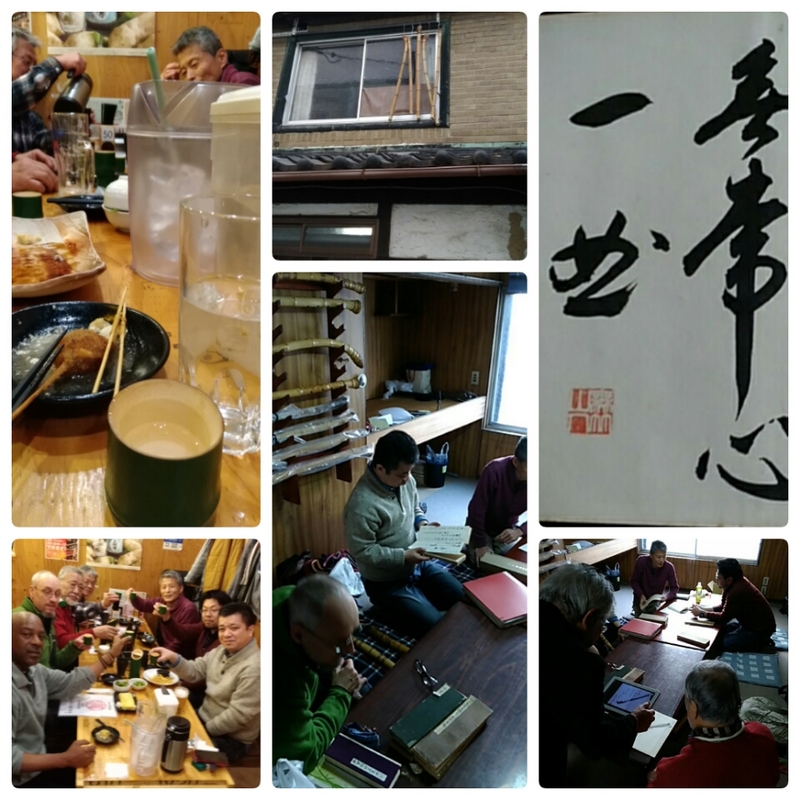 We had our monthly meeting the other day, and make shift New Year’s drinking party. Our practice is usually at a community center but this time it was full so we had it at the “header’s” workshop. There was suppose to also be a joint meeting that day with some group that had something to do with Komuso. That was postponed for whatever reason. I am glad I have the hookup with my Sensei for the Komuso entrance, so I do not feel a set back from the meeting cancelling. I uad a map and direction to get to the meeting location, even still, I had some difficulty finding the place. Japanese can be very helpful just out of the blue. A woman leaving her home to go somewhere, saw me looking looking lost with a large case on my shoulder. She asks, am I looking shakuhachi gathering, shop, sensei, something. I say yes, she takes me to the shop just around the corner. Not where I would have looked, at least right away. I enter and see a bunch of shakuhachis on the floor, I am thinking they are just things Oota Sensei is working on. There are a lot of song books on the table. Most of the meeting time was spent on these items. I was told several times about checking out the Shakuhachi on the floor, at least what I thought. This is what I understood. Once another sempai showed up I got more details. The former sensei, or his master this was his stuff, the flutes, the books, the music. The books had ink drawings with kanji, of which I had no idea. The pictures looked interesting, Sumi style ink drawings! Made by the master or friends on his who wrote in his books? At the meeting that day, most of it was spent looking over this wealth of info, only a little time spent actually playing. Then it was only the one song, which I think is one the group is playing for and anniversary party for one of the members. From what I was told, Oota sensei is making everyone new 2.5 shakuhachis to play for this event in Oct., that would be cool! As time moved on, so we also made ready to do so. We packed up and head to an izakaya(bar n grill) for drinks, food and chatting ! Snacks, sake, shochu flowed freely. Not being a hard drinker, I almost had too much. On the way home and once at home I was on the edge of the too much tilt! Laying down and a nap helped when I arrived home. It was a fun and different for me as I do not usually go out drinking and hanging with the guys. As my Japanese improves, it will become more interesting. With all of us sharing the bill. It was reasonable at 2,500 yen ea for as much as we ate and drank. LZ was surprised at the cost she was expecting about 5,000 yen. I can not do the eat drink thing all the time, even at the low price since not working. However sometimes it is good, and it comes out to about the same as taking two classes a month, which the minister of finance says is ok to do. Since I have cut back to once a month on my class, it comes out to about the same…about. On the other hand it is still part of the Shakuhachi study and learning Japanese culture. Maybe I will have a book one day, my life and retirement times in Japan. I do not think any old farts like me have done such a thing as I am doing with Shakuhachi, Kyudo, Komuso, sailing and modern bands. Temple (shrine) 1: Kakuta- Hachiman. I had not planned on doing this, it just happened. The best adventures can be had doing that. Even if not outstanding, good is good. The better ones leave your spirit buzzed…like this one. Dec 31 evening was spent at the Kakuto-Hachiman shrine, there was the New Year event, praying and shooting of which I posted. Been there did that. FYI : Shrines are Shinto, Temples are Buddhist, I am calling them the same here…deal with it! The next day LZ and I went off to see her Ookasan. On the way there she says to me, there is a temple right next door to Ookasan, can we stop? It is supposed to be famous, historic Buddhist. We can pray there, I do not usually do it, but… Ok, we stop by. It is larger than I thought, but still small. The yard is well done, I like the ponds. 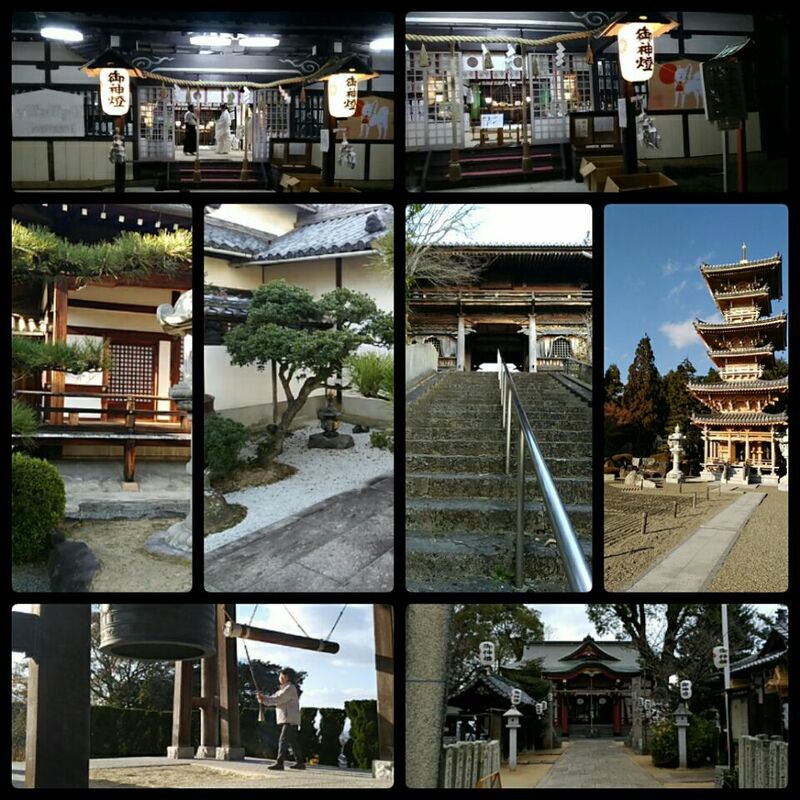 We looked around a bit, prayed and then moved on to see Ookasan. The temple yard impressed me. There were a couple of spots one could sit, meditate. I am envisioning this as my staging area when I start Komuso in this area. Go there first sit, meditate, play, then, do the walking practice from the temple gate. Down the street and back, then expand as I get my nerve. Hahaha. The next day was to be a mostly home day. The weather was great, cold but not unpleasant. I had an appointment to see my Shakuhachi sensei, after my morning. practice. He was concerned about my not having a flute and the repair, replacement on mine. He offered to go with me to see the person, who suggested I buy a new one’s wares. If I choose to go that route and did not have the money to spend on a basic one from his friend a major Master Shakuhachi maker. This person’s beginners flute started at $1500.00. Wayyy out of my league with no income. He also checked with this person about repairing mine. He was going to see The Master Maker this week to make a pickup of an order of his. He would take my shakuhachi along for him to check. Ok, I go along as he is my sensei. We met after a mixup of going to his house not his studiohouse. Sensei and I connected and he served tea, we spoke about the shakuhachi. I put a limit on how much I would spend after, It was clear what was happening. This Master Maker maybe doing this, or will do this as a favor for sensei, from the way he spoke they are more than just customer/ client, more friends. I am going with the flow on this. But back to the temples, I digress. After visiting sensei I told LZ to my favorite temple in the area. She had never been there or even know of it. Not really her thing old historic temples. However with the NY on us she was into praying. This temple is about 10-15 bike ride from our house. It is really more of an actual pilgrimage feels like, because we have to really make some physical effort to get there to say a prayer. So it felt kind of cool, without planning it to be that. The next day, I again was up and going to get into my morning Motion Chan. The last few days I have been in the parking lot, which is comfy. However I thought I would like the shrine vibe for practice since it was the Near New Year. Perhaps it was finished with the crowd there by now, an I can get my practice spot in the back. It was starting to rain a bit as I set out, I thought the trees at the shrine maybe enough, the rain was light. I arrived there were a number a people and a few of them looks rather busy doing something in the yard. I started not to go in, but thought I would anyway since it is my local Shrine. I would not practice but I would pay respects. The caretaker and I spoke and bowed for the NY,. I kept it short at the Temple and bowed and left. Activity was in motion there on the sidelines. I went of off to the lot and practiced. It dawned on me as a was walking , I had done four temples over the last four days. I found out later it is an old Japanese custom to celebrate the first three days of the NY. I fell into that easy enough, with my own flavor. This maybe my new, New Years Tradition, added to the 108… hmmm maybe as komuso training/ offering at the temples. 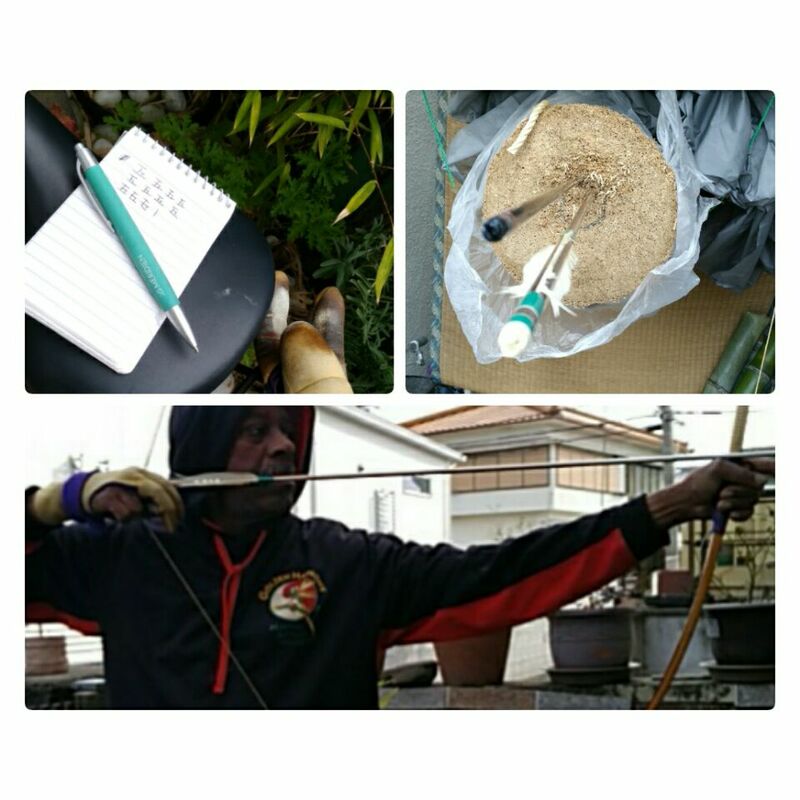 As I have been doing for the last several years, I shoot 108 arrows for the new year, same as the Buddhist ringing a bell/gong 108 times…cerimony. A friend started it I have taken on the training. I was set this as in the past to do my shots here at the Bamboo Mantis Hidden Makiwara Kyudojo. 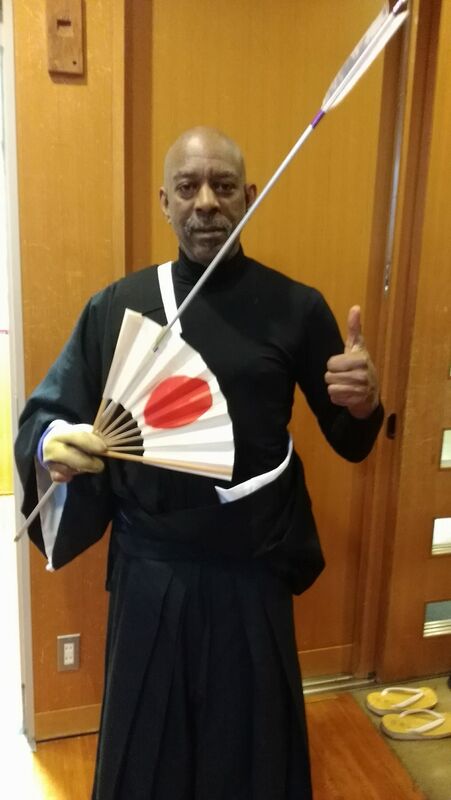 Out of nowhere a sensei, who I am friends with and have played music with, he asks if I wanted to come to his dojo to join a New Year shooting. It took me a while to get all the details correct and figured out. Sempai’s (the sensei) dojo is the one kyudojo that I tried to join when first in this area. They said no, after telling me yes, and me showing up, changing and ready to shoot. Then they dropped the no bomb. I was told that the club owner said no new members. I am thinking hmmm yeah right…but let it go. Still I was bummed out! 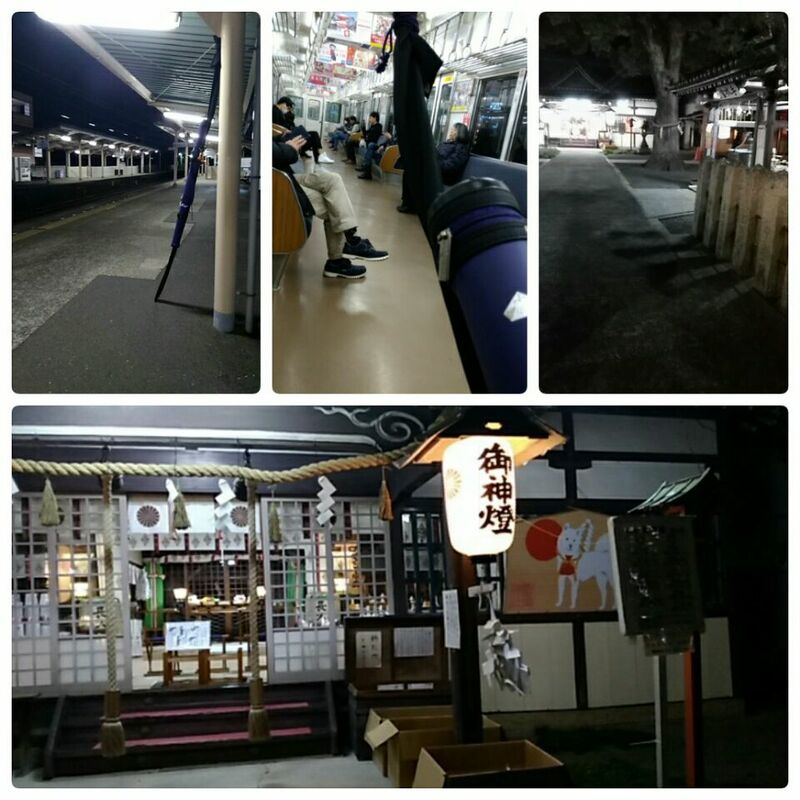 I was told I could go to Kishiwada, which I did and I am pleased that that it worked. Trusting the force to provide for my best. As it turns out several of the Senseis and a Sempai that help me at Kishiwada are from this other dojo. I have heard on other times that the story is indeed true and not a “me” issue. Ok, onward, so this Kyudojo is connected to a Shinto Temple. So this turns out to be a local New Year event. 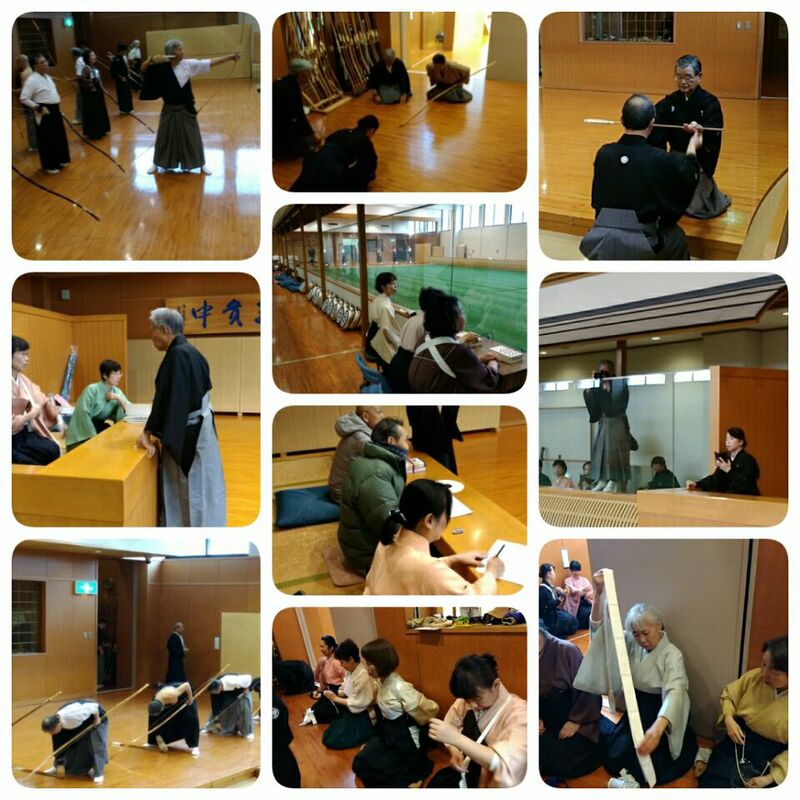 The dojo opens, we shoot, there is a ceremony of some sort, then the windows of the dojo are opened so that the locals that come to tthe shrine to pray for the new year can also watch us do Kyudo. I was told this was to be an all night thing basiclly. Someone give me a ride home. There were a couple of other people from Kishiwada going as well. Cool I thought. After I got all the infor sorted out, I was all in. Now there were some things I still did not know, but i would just go with it and see. I knew the basics, I show up, I can shoot, dress really warm, there will be something hot served, there is a cerimony, do not worry about the train home. I was set. I planned for a full day, a long full day. I figured to do my 108 at home since I had no idea how much I could shoot or how long it would take taking turns, getting the ya, etc. Where they also doing some version of the 108? Hmmm. Ok, i figured, whatever this is a training day a, purifying day. First off some Zazen, and then breakfast. Next out for some physical Chan, and some tea. I am ready to start now. I figured to cruise through this, I the full day to do this, so I would pace myself. I did a four sets of 5 before taking a tea break. This then back at it. This time going just a point past halfway. Break time. So yeah, now it is hurting, there is a new little bluster, and torn open on my palm. Warrior training spirit says ” there is no stopping until finished, deal with it”. After some thinking, I had a pair of gloves I was going to use for komuso playing when it was cold. The finger tips are cut off. I dug these out and tried on the left glove. Perfect, white cotton, l with just enough cushion. I tried it out it worked so. i went back to practice. I shoot for about 5 min before it started to rain. Wow, I am thinking, the force is testing my resolve. It was not raining hard. I continued, since my yumi is fiberglass and bamboo. Weather is not and issue. Great I was able to have the blessing of two Yumi, bamboo and hybrid-glass. It rain little on and off through my next set of shots. During my next tea break, the weather app said the rain would be fully done about now. Yes after my break the rain was no more. I continued, shoulder and chest starting to feel the strain now, still, I pushed. I tried to stay focused , a mindful practice, attention to each detail of each shot, not just shooting for the numbers. Kishi sensei says don’t just play your shakuhachi to make sounds , notes, make the note have the best quality. As I neared the end of my 108, I had another break pre-planned , bit decided to press on and just do it. I stopped when I had completed 106 shots. I figured no matter how many people there was at the dojo tonight, or the order of things, I would have time to have at least two or three sets of shoots. I would wear the glove, I would try to anyway. It was plain white, this was not a class, so it should be ok, I thought. I will removed it if I have too. Another reason to do most of my shooting at the makiwara, no one tells me how to dress. So for the most part I was finished my 108. I got things organized for the evening. A shower, some food, a bit of sake, then practiced some “Suizen”. It was a great day so far. In the back of mind I was thinking about what to expect tonight at the dojo. Really the main concern was how cold would it be? I was dressed for some what I thought would be fairly serious, at least for me, I am a cold weather wimp. I had on maybe for or five layers of tops, silk, and cold weather poly things, plus leg’ns . My main concern would be for my head, with no hair. I had a silk kimono, and coat, we were going to be inside, so that part should be ok. I arrived early to the shrine, way early. I walked around, did few New Years prayers, took pictures…facebk’d, killed time. Finally someone arrived. I did not know him, he asked if i was from Kishiwada. Shocked I thought everyone knew that. Maybe just checking. He made a small joke about me being early. I did know him so I continue to wait outside while he opened up the dojo. Short while later my dojomates showed up. I went in with them. Slowly others arrived, we all settled in as they lite the heaters, and setup the bean soup, made ready the yumi and ya, everything set to shoot. Little by little they started, there was nothing official happening everyone just went up and shot. All was very relaxed, many sat by the heaters chatting and staying warm. Little by little things got more organized and more started shooting. Near 11:30 we were instructed to go to the next building, to where the ceremony would take place. We all went into the main temple, the Shinto priest where all ready. We all had a seat on small folding stools, no kneeling. That was a relief, my knees could not have taken it. Ok, i wanted to take some photos but I thought that would be not cool. I resisted! There was a little bit of chanting, incense, bowing, usual stuff. However short and fairly simple. The priest blessed the group everyone bowed and it was done. Everyone went back to the Dojo. I got a few photos outside. Once back in the dojo, the sweet bean soup was ready. Mochi was added a short wait and it was ready. Bowls were handed out. It was not to have something warm and sweet, perhaps a little too sweet, but it was still welcome and good! I had a second, but small helping. Now people really started shooting in earnest , it was almost 12:00 now. I heard someone start the happy New year phase when it was midnight. Everyone said it to the group and continued to shoot. It was not a 108 shooting, just a New Year’s shoot. Just after finishing my home shots, when took some time to do SuiZen after the 106 shots. Anyway, yeah, the string broke, i had a spare, but since it was so late i just stopped. I was under the impression that something opened at 1:30 am. But what it was , the Dojo was closing at 1:30 am. So my string bit the dust at 12:40. I was done for the night. All worked out. Good I did most of my shooting at home for my counting goal. I couple of people asked about my glove, did I hurt myself, or what. i explained, they said ohh. My Sensei asked, when I told him I was screwing up my tenouchi in my practice. He laughed as did I . My sempai came to me as everyone was packing, and said he would take me home. Argatou. It was a good experience. I am pretty sure the first Gaijing involved and attending. So onward into the New Year. I am feeling this is the year I will go to the next level of understanding. I can feel some improvement when I shoot. I still have much to do, but I am finally feeling some progress. Year of The Dog will be successful for my Kyudo endeavors.